PRV-6 Idle Setting Procedure. [Tips from Dan Roth, who archived them from a list] Here's the V6 idle setting procedure that I've been able to find in my archives. One thing that could be causing your surging idle is a dirty throttle body. This is a real problem, if the TB is plugged so badly that all air regulation at idle goes through the Aux Air. Clean the throttle body, it's easy enough, but DON'T adjust the throttle stop. Just to make it clear DON'T ADJUST THE THROTTLE STOP - not till later. Just clean the TB. 1. Run engine for 15 minutes so that it warms up. 2. Turn rearmost (idle speed) screw in fully. That closes a passage to the front two (balancing) screws so that turning them at this point won't have any effect. 3. Adjust the throttle stop so that the engine runs at 700 rpm. May be a little rough, but never mind. 4. Turn two front screws in fully. 5. Turn rear screw out four complete turns. Since step 4 resulted in the idle air passages to both banks being closed, this should not change the idle speed at all. 6. Connect rev counter (handheld meter, not the dashboard kind) and note the exact idle speed at this point. Should still be 700rpm. 7. Turn out center screw three complete turns. Note the new idle speed, should be around 1100-1200 revs, but this isn't critical. Just make a note of whatever the number is. number of turns you so determine. Idle speed should be at about 1300-1400 rpm afterwards. 9. Finally, use the rear screw to get idle down to 900 rpm. Then check CO level and adjust if necessary. If you're a perfectionist, take the car for a few minutes' drive, then check idle speed and CO again. V-6 Poor Hot Restart. [Query:Alex] A few weeks ago I made myself an LED diagnostic tool so that I could make use of the diagnostics which come with my model of MV (760 v6) ps if any one is interested to make their own , email me and i will be happy to obligue. To return to the story, When rigged the LED flashes 6 times (indicating that the sensor which sits on the #1 spark plug lead is not working). Is there any EASY way I can confirm the non operation of this sensor? Another request. Periodically, the car does not start easily (engine turns for about 20 to 30 seconds)when the engine is hot and the car has been standing for say 30 mins. When it does start there is a faint smell of fuel. I have been advised via brickboard that it could be the flywheel sensor. Here in Aus I have been quoted equiv usd $120 for the part so naturally I am keen to confirm that the flywheel sensor is not working before purchasing a new one. I would appreciate it if someone had a way of confirming the operation of this sensor as well. [Response: Abe Crombie] The #1 plug wire sensor is polarity sensitive. Make sure the wires on coil are correct, red/white on terminal labeled 1 and blue on the terminal labelled 15. The sensor could be on plug wire reversed if someone changed the wire and slid it on wrong. This wouldn't make it have start problems when hot. 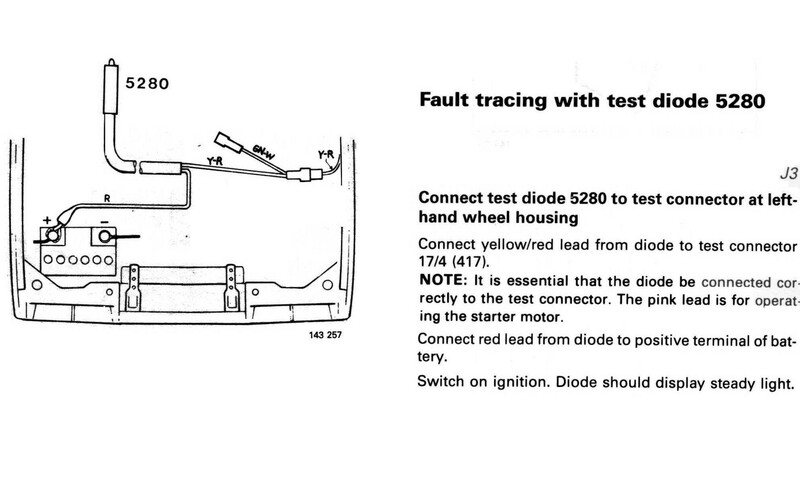 The sensor is used to ID the firing order for proper knock sensor use since it has two knock sensors. Pull the vac hose off of the fuel pressure regulator and see if it has any fuel residue in it. Run the engine and then immediately remove the return line off the fuel pressure regulator (soft rubber hose held by clamp) and see if any fuel continues to drip out of regulator. Any loss of residual pressure from system will cause hot, short shutdown starting problems. A dripping leaking fuel injector would do the same. The best way to check this out would be to use a fuel pressure gauge if available. The check valve on fuel pump can also allow fuel pressure loss when shut down. Solder resistor to positive LED connector. Solder remaining electrical cable to other resistor leg. Cover whole of LED, resistor etc. with insulating tape, leaving gap to see LED flash etc. 1 flash - Engine knock has occurred, activating knock-controlled timing retardation. Can be due to inferior grade fuel, excessive engine temperature, faulty plug, intake system leakage or engine carbonization (due to frequent cold start and idling). 4 flashes - Faulty signal from knock sensors or faulty knock detection circuit (internal to control unit). The unit will flash out the code, then there will be a noticeable delay, when it will flash the code again. Some of the codes will only be flashed under load, so if you get no code at idle, take the car for a drive, accelerating etc. The attached drawing shows sensor connection.